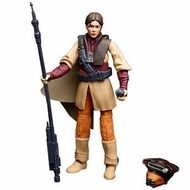 Re-create your favorite Star Wars Rebels adventures with this realistic Boushh figure! This detailed figure looks just like the bounty hunter Boushh, and he has the weapons to track down his bounties and take them out. Your collection – and your adventures – won't be complete without him! Star Wars products are produced by Hasbro under license from Lucasfilm Ltd. Hasbro and all related terms are trademarks of Hasbro.